The Children's Discovery Museum of San Jose is dedicated to inspiring curiosity, creativity and lifelong learning in all those who visit. At this institution of discovery, children engage their imagination and explore the world around them, while teachers, parents and caregivers find support through the organization's resources. Since opening, the museum has welcomed more than 8.6 million visitors. The Museum considers itself a champion of the world of wonder, presenting exhibits, programs and activities that pique the interest, nurturing a fascination in exploration and learning. Aptly named, the Museum encourages children to discover the world in which they live, igniting the spark of innovation in young minds. 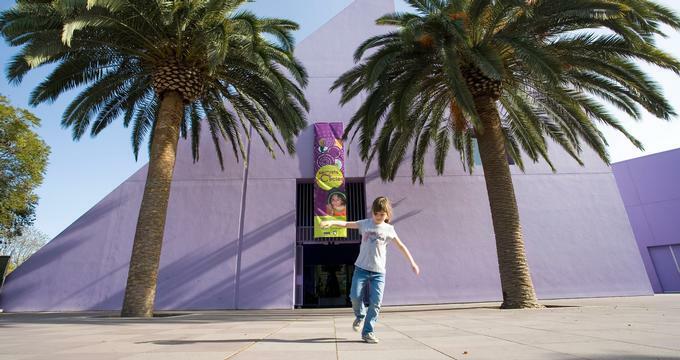 Doors opened at the bright purple Children's Discovery Museum in San Jose, California in June of 1990. The expansive edifice, designed by renowned architect Ricardo Legorreta, has welcomed more than 8.6 million individuals into its world of wonder since that day. Spanning 52,000 square feet inside, the exhibits within cover a wide range of topics. Since the Museum's opening, the center has been honored with multiple awards, including the Association of Children's Museums Promising Practice Award, The American Association of Museums Excellence in Exhibitions Award, Charity Navigator's Four Star Charity designation, Bayarea Parent Hall of Fame designation, and many more. Exhibits at the Children's Discovery Museum of San Jose are so varied, there is sure to be something to interest any kid. 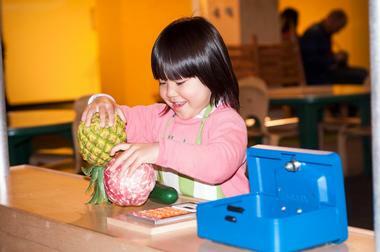 From art activities to bubbles, circle secrets and waterways, kids and parents will find much to entertain and engage. Exhibits are designed to activate children's creativity, pique curiosity, while developing critical thinking and problem solving skills. Works in the art gallery celebrate expression through the visual arts, and includes work by children and adults alike. The curated gallery promotes greater understanding of how different people, groups, and cultures express themselves. Many of the artists represented in the gallery are nationally and internationally recognized for exploring themes that are relevant to children and their families. After viewing the work of others, kids can become an artist themselves at the Art Loft. This space provides a plethora of materials and mediums to spark creativity and bring out the inner artist of any child. The work undertaken in the Art Loft emphasizes the process of creating the work, rather than the outcome of the specific piece. Always a favorite with children, bubbles evoke a sense of whimsy and wonder. The Bubbles exhibit at the Museum builds on this natural fascination, exploring the science behind bubbles, while still appreciating their simple fun. Kids can experiment with different ways of making bubbles, stack them on top of one another, find out why bubbles are always a circle, and, as always, run around of trying to catch them. 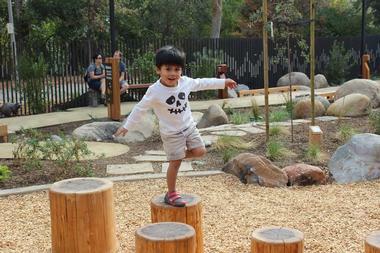 Bill’s Backyard: Bridge to Nature is an integral part of the Museum, featuring a new, outdoor learning environment that encourages children to climb, dig and build. The Kids in Motion exhibit is designed to keep kids and families active and healthy. Specialized equipment in the area incorporates music with movement, creating a more enriching and engaging activity. Kids move up and down Soundstair, the Museum's musical staircase, hearing the notes and creating the song with their moving feet. With fascinating fossils from an ancient mammoth, Mammoth Discovery invites children to imagine the work of archeologists. Hands on activities in this exhibit include investigations and experiments, including an examination of a mammoth discovery that occurred in San Jose. 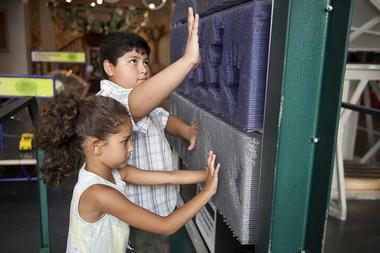 Kids can also see full sized replicas, giving these massive ancient creatures form and scale. Rainbow Market is an interactive market with something for the whole family. Kids can purchase produce, drive the food truck, take orders or make pizza in the play oven. Families can vote together on their favorite drinks or take home healthy meal ideas. The Market also encourages kids to "eat the rainbow" of five colorful fruits and vegetables every day. Other activities include making corn husk dolls, shopping at the farmer's market, and preparing a pretend meal in the mini kitchen. Exploring the wonder of an everyday shape, Secrets of Circles examines this form found all around. This exhibit combines math, engineering and creative activities, learning how circles aid engineers, are used in dancing, or are found in nature. Kids go on circle scavenger hunts, use circular gears to build a moving toy, see how mirrors make symmetry, and more. The Streets Exhibit encourages children to examine city life around them, from power lines and fire engines, to crosswalks and medics. Hands on activities and experiments draw kids into the action, incorporating them into the learning. These include role-playing activities that challenge children to work through problems and develop their communication skills. From sparking an interest in the generation and movement of electricity, to capitalizing on children's love of fire trucks, the exhibit interests and excites its visitors in many ways. Performing arts at the Children's Discovery Museum of San Jose take place in the Lee & Diane Brandenburg Theater, as well as the Cadence Amphitheater. These venues provide an outlet for kids to experience performing arts, learning about dance, music, film, theater and cultural festivals. The learning that takes place on these stages challenges kids in myriad ways, to communicate with their body differently through dance, to imagine the world from a different perspective through acting, or to learn about different cultures through art like Japanese Taiko drumming. These are just a few of the many activities and performances available at the Museum's theater and amphitheater. Anyone who has ever taken a child to the beach knows kids are fascinated by water, from fountains, rivers, and streams, to water guns and water balloons. At the Waterways exhibit at the Museum, kids not only play in the water, but learn a little something in the process. Using their natural interest and curiosity, this exhibit explores ideas like water pressure, water flows, flotation and more. Set inside in a specially constructed exhibit area, the feature is a feat of engineering itself, from its slip resistant floor to its massive water filtration system, Waterways is must see at the Children's Discovery Museum. The Wonder Cabinet inspires curiosity and stirs the imagination for the youngest adventurer's in the crowd, up to age four. Referred to as the Museum's "early learning laboratory", the 3,100 square foot space is teeming with different colors, textures, materials, and activities. Three different areas, the Art Studio, the Forest and the Crawl Space entertain and engage in different ways. 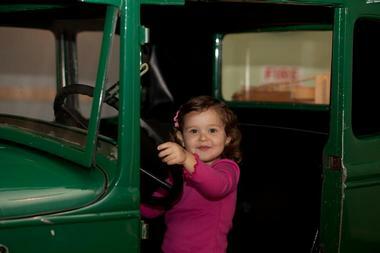 Daily activities targeted to specific ages make the experience even more engaging for tiny tots. The newer West Wing area of the Children's Discovery Museum of San Jose features temporary and changing exhibits at the Museum. Such exhibits often interact with other part of the Museum, such as in The Amazing Castle, which incorporates role playing lords and ladies, pickling vegetables in the garden, and workshops to experiment with different jobs such as tailor or carpenter. In addition to the abundance of activities on offer throughout the exhibits, the Museum also offers daily, weekly and special events to make the visit even more enriching. Daily events change periodically, but often include story time, special activities in the garden, and crafts in the art studio. Weekly events often consist of Sunday Matinees featuring family films. Other events include Meet the Artist talks and activities, Music Fun under the Sun, and family evenings including food, activities and entertainment. The full calendar of events is available on the Museum webpage, which visitors are encouraged to review prior to arrival in order to make the most of their visit. In keeping with their mission to inspire creativity, curiosity and lifelong learning, the Museum also brings Discovery out into the community. School programs include field trips and experiential learning activities for teachers to incorporate into the classroom. Special courses and offerings for kids range from Summer of Service for grades seven through ten, weekly classes like Discovery Youth Media, or volunteer opportunities. Programs for the younger discoverers include family science nights, and at home learning activities. The Museum also offers specialized programs for children with special needs. The Children's Discovery Museum of San Jose is conveniently located near major frees, just a few blocks from downtown San Jose and the Tech Museum of Innovation. Parking is not available onsite; however, there are several parking lots available within a short walking distance. The Museum is also readily accessible via Light Rail and bus. As hours and events vary, visitors are advised to review the Museum's website prior to arrival. Meals and snacks are available at the onsite restaurant, the FoodShed, which features healthy and nutritious bites. With a dozen exhibits to entertain, educate and engage, the Children's Discovery Museum of San Jose is a day of discovery well spent.